Composed by Robert D. Vandall, Martha Mier, Mary K. Sallee, Ryan Brechmacher, and Catherine Rollin. Method/Instruction; Promotional Packet. Halloween Sheet Solos. Other. Alfred Music #00-105480. Published by Alfred Music (AP.105480). 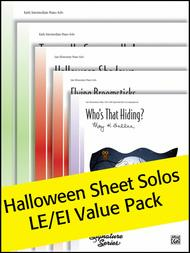 This Value Pack includes five Halloween sheet solos at the intermediate level. Titles: Flying Broomsticks (LE) by Robert D. Vandall * Halloween Shadows (LE) by Martha Mier * Who's That Hiding? (LE) by Mary K. Sallee * Dancing Goblins (EI) by Ryan Brechmacher * Tarentella Scarentella (EI) by Catherine Rollin.